I can’t stay away from IPAs. There was a time when I did not like IPAs at all, but, because I’m stubborn, I kept drinking them, over and over again. Now I kind of like them. I really don’t know how I feel about the name of this one: Becky Likes the Smell. I dig what they’re referring to, as the can promo woman is holding a hop (one hop?) in her hand, but man, I dunno. The IPA does smell good. Smells like a fruitier IPA. Sweeter, maybe. No credit for the can art though. Not sure how I feel about, Bay State Brewing Co.. Anyway, it’s late and I need to write this blog entry and drink this beer. And not sure how I feel about this one. I feel like the can over-promised on this one. Supposedly I can taste notes of: tropical fruit, pear, spice, melon, pine and citrus. I feel like you’d be hard pressed NOT to taste pine and citrus in an IPA. That’s just what hops taste like. It’s just a little empty, especially considering that this is a double IPA. I expect a little more oomph from a double IPA, and I don’t just mean with the alcohol. Other double IPAs really pack in the flavor, sometimes to an overwhelming degree. I’d say that if you want a lighter, more refreshing double IPA, than this one is a good bet. Not too much backbite with the bitterness, but when they say subtle notes on the can, they mean subtle. It’s definitely not as sticky as some IPAs can get. Great can art. Ok beer. Upsetting name. Six robots that transform into cassette tapes out of eight. I decided to take another crack at a Collective Arts Brewing IPA tonight because I enjoyed last night’s so much. The initial smell is definitely not as intense as it was last night, but this is not a Double IPA. I will say that IPAs are a devil of a thing to review because unless a company is actually trying to make a distinctive flavor, mostly all you get is the in-your-face flavor of hops. This one smells a little citrus. The one last night reminded me a great deal of a Ballast Point IPA and I’m getting the same vibe here. Oh and the art on the can is by Annabelle Popa. She does some pretty cool comics that you can read through her site as well. Sorry, forgot about the beer for a moment. It’s another solid IPA, but there’s nothing that particularly stands out to me about this one, unlike last night’s offering. Again, it doesn’t aggressively overwhelm me with bitterness and again it’s very pleasant. There’s no point where I feel let down, where it’s too airy, or too light. It’s ticking the boxes for everything I want in an IPA. I just realized I’m coming across as disappointed and there’s nothing to be disappointed about. I think this is a good IPA starter, if you’re not a huge fan of IPAs or you’ve never had one, you won’t go wrong trying this one. It’s still bitter, but it doesn’t linger like in some craft IPAs. It’s complex enough to not be boring, but not overly heavy and it has a decent kick, in terms of alcohol content. I give it five IPAs out of four t-rex pepper shakers. Emily and I walked passed our local alcohol shop when we saw that they were hosting a beer tasting. Since I don’t turn down free alcohol (EVER), we went inside. 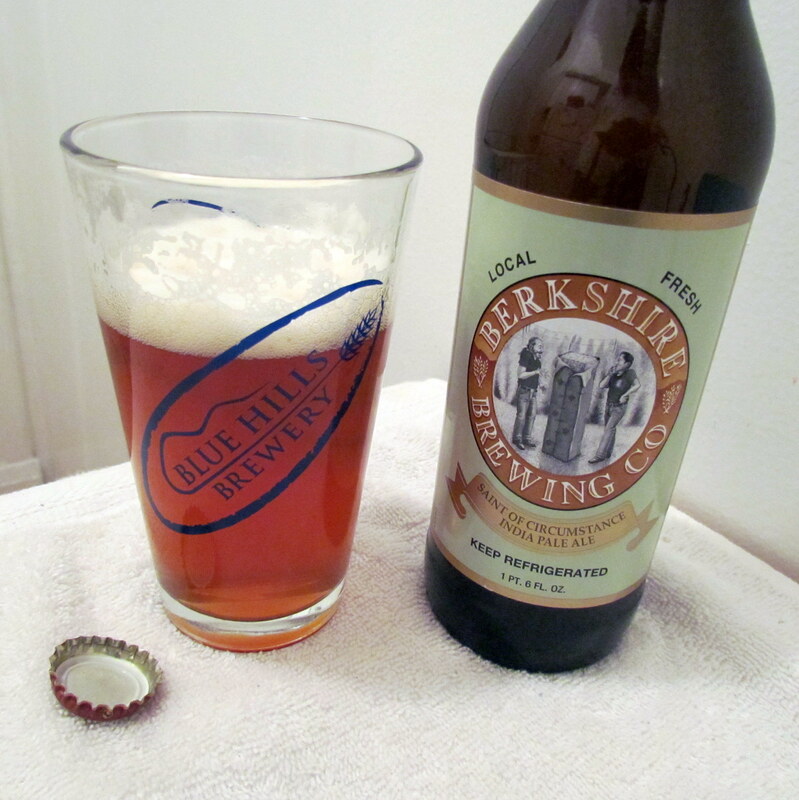 The brewery was Berkshire Brewing Co., a local brewery that has a fairly wide selection to choose from (including one that tastes like coffee). I grabbed their Saint of Circumstances IPA, as well as their coffee thing (which I’ll definitely be reviewing later). Saint of Circumstances is not their regular IPA. The guy running the tasting told us that, due to a fire, they got the wrong shipment of hops. As a result, they ended up brewing a completely different IPA of which they have only a limited quantity and that they’ll never be able to recreate since they don’t know which hops they were shipped. The moment I heard that it was of LIMITED QUANTITY and soon it would be GONE FOREVER, I had to have it, because I have no willpower when it comes to marketing. As far as rare, soon-to-be-extinct IPAs go, I think this might be one of my favorites. Unlike some recent IPAs I’ve had, it’s not overwhelmingly bitter. It still has some bite, but just enough to make it interesting. It’s smooth and light with a good clean finish. I didn’t taste the smokiness that the bottle talks about, but there is that vague flavor of grapes that IPA all seem to have in common. I recommend it if you happen to be in the area and have a chance to actually try it. And if you like IPAs. Or beer in general I guess.